HAIX® has selected three tactical law enforcement teams for its Police Magazine wear test. The selected teams are: Lancaster County, Pennsylvania SERT, San Francisco SWAT, and Seattle SWAT. Participating officers received their choice of HAIX® tactical boots, including the GSG9-S, Black Eagle® Tactical 2.0 GTX High, or Black Eagle® Athletic 2.0 T High Side Zip. 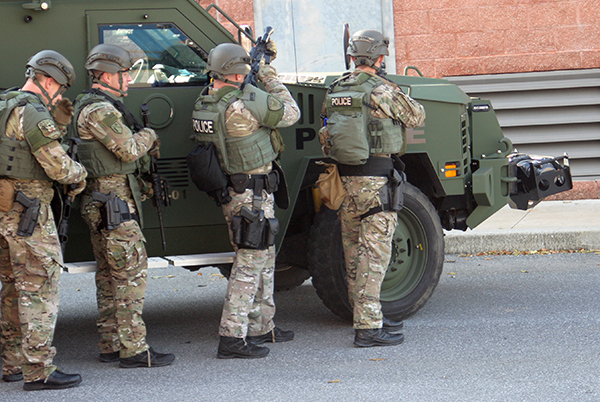 The Lancaster County SERT Team is a countywide unit providing rapid response to incidents of potential violence, barricaded gunmen/hostage situations, and threats of terrorism. Members of this team have already been testing out the Black Eagle® boots during training and sent in pictures of their new footwear in action. Officers will wear the boots for one to two months and are expected to put them through their paces. At the end of the test, they will offer their feedback which will then be used for an article that will be published in POLICE Magazine and on PoliceMag.com.